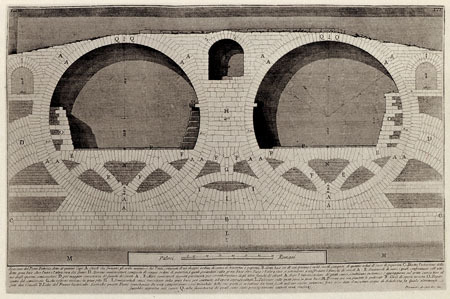 [Image: The interlocking circular network of compound arches beneath Rome's Quattro Capi Bridge, engraved by G.B. Piranesi, patron saint of BLDGBLOG. Scanned from the insanely stimulating and highly recommended Complete Etchings]. If you'll excuse a brief moment of celebratory self-reference, BLDGBLOG has just been named one of Yahoo's top 25 Picks of the Year (right next to The Ricky Gervais Show, no less). So thank you, Yahoo! And thanks to Alexander Trevi, as well, for pointing this out; don't miss Alex's own blog, Pruned – itself a former Pick of the Day. it's insanely stimulating, but is it "Insanely Great"? Yep - it's both. And it's damn cool, too. Very worthwhile pick, as most of your readers surely know. This post reminded me that my weekly page was a pick of the day waaaay back in November 2000. It was shared, though, with a bunch of other pages, about half that are no longer around. At that time my page was on a free, no-banner server called Internettrash, and the links still point there. Funny (at least for me).